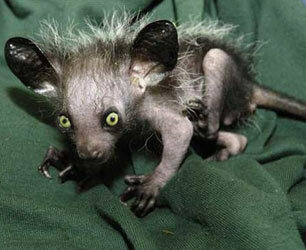 The aye-aye is a lemur, a primate that is native to the island of Madagascar. For many years it was considered a rodent due to its protruding--and ever-growing--teeth, but in recent years it has been established as closer in relation to chimpanzees, apes, and even humans. The aye-aye is considered an omen of bad luck to natives of its native Madagascar, who will kill them once they are found. After they are killed, natives will hang the carcass of the animal upside down on fences to ward off evil spirits from their homes and other areas. 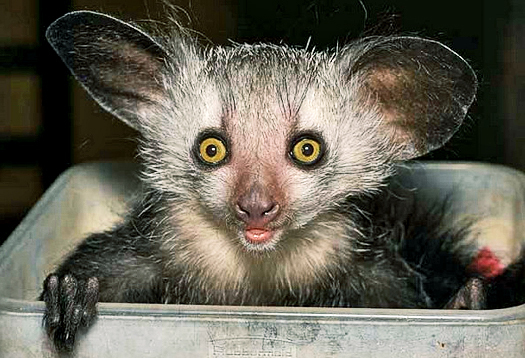 It is only because of the efforts of preservationists that laws have been passed protecting the aye-aye, allowing them to make a comeback in terms of population. What do Aye-Ayes look like? 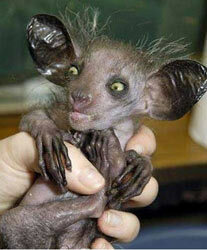 To put it bluntly, most people wouldn't consider an aye-aye attractive. 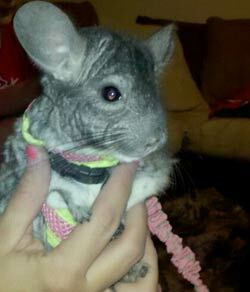 Since many of them come in beautiful color combinations, there are many who chose to make them pets. They have large eyes and a long bushy tail just like a squirrel, but with forward slanting incisors. An aye-aye's teeth are constantly growing and are only kept in check by the chewing they do in search of food. When they are young, their fur can range from grey to black with lighter colored stripes. 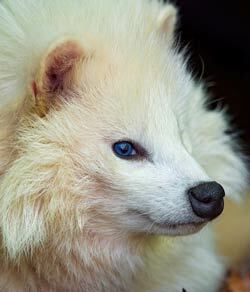 Once they start to age, however, their fur turns more of a single color. 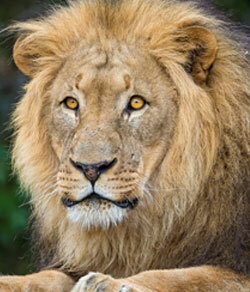 Their outer fur tends to darken while their underside and chest often turns white. Their tail is normally the same length as their body. 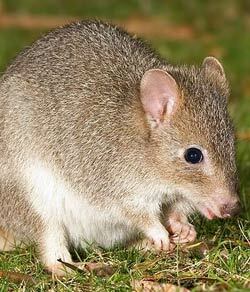 Their forelegs are long and naturally adapted to foraging, but their rear legs are short like a rodent. 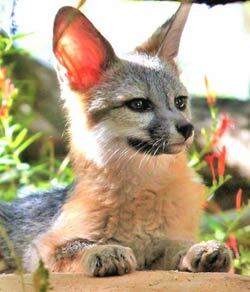 They have large naked ears and large eyes that give off a yellowish brown tint. Aye-ayes are nocturnal and are most accustomed to living in the tops of trees. In fact, they spend very little of their life below the treetops immediately below the dense cover foliage. They eat, sleep, travel, and mate in the tops of trees. They spend very little of the daylight hours outside of their nests, which they construct in the forks of trees. These nests are made of leaves, small branches, and vines. When darkness comes, aye-ayes begin their search for food. 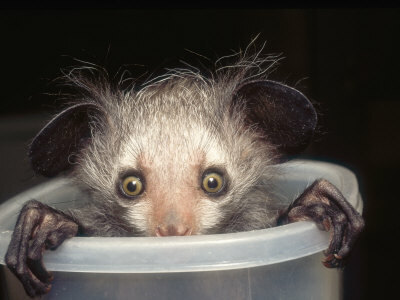 The Aye-aye is a loaner by nature, making its solitary home and establishing a territory with its scent. They are known to share their nests with other males, although not at the same time. The territory of the female is considerably smaller, although that area could encompass three or more male nests. Male aye-ayes tolerate each other very well, until there is a female near, at which time they attempt to establish their dominance with aggressive behavior. Aye-ayes are sometimes seen in pairs, but are largely solitary, which contributes to making them hard to find in the wild. They are largely silent, but will sometimes send out sharp shrieks. The largest predator of aye-ayes is man. Besides this, aye-ayes are very fearless and have few natural enemies. This is another reason why aye-ayes were approaching endangerment until only a few years ago. Plainly stated, a superstitious native population killed them whenever possible. Also causing the dwindling population of aye-ayes is deforestation and the encroachment of man. There is no particular breeding season for aye-ayes. They breed whenever and wherever they have the opportunity. 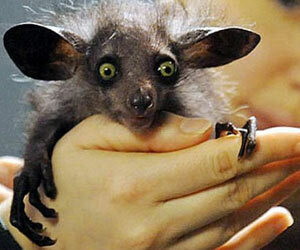 The gestation period of an aye-aye is 170 days. Females breed every two or three years. An aye-aye normally gives birth to only one young at a time. Once the young is born, it suckles from its mother for about seven months. How long do Aye-Ayes live? Aye-Ayes live for about 10 years. Aye-ayes are natural omnivores, which means that they will eat practically anything. They are particularly fond of beetles and grubs, but will eat virtually anything they can find. Their method of hunting for bugs and other small creatures is unusual, however, using their narrow middle fingers on each hand to tap on tree branches until the sound indicates that there is a hollow chamber inside which might contain a meal. This tapping is known to resemble the pecking of a woodpecker. Once the aye-aye has found its hollow chamber it will chew the branch or trunk until they find what they are looking for and can dig it out with its long, thin fingers. As opportunities present themselves, aye-ayes will also feed on coconuts, mangoes, sugar cane, and eggs from villages and plantations. Some research suggests that aye-ayes prefer sap and vegetables to most insects, specifically insects such as grasshoppers, worms and larvae. It's for this reason that in captivity aye-ayes can be fed virtually anything that even approaches their natural diet, with considerable variations allowed. Thanks largely to conservation efforts by officials of Madagascar and other areas, aye-ayes have made a comeback in terms of population. It is primarily thanks to this that those who wish to own one as a pet are able to purchase one for keeping in captivity. Those who own aye-ayes need to keep them in a large cage that allows considerable room for movement, resembling their natural world. For this reason also they should be given plenty of foliage to climb on and live amongst. Aye-ayes move much like a rodent, quickly, so it would be difficult to get one back inside a cage if they ever got out. Further, between scent-marking their territory, being very inquisitive, and not being house trainable, an aye-aye is not normally considered a good pet. In the case of medical care for an aye-aye, it is best to take one to a veterinarian that specializes in exotic animals. Unfortunately, by its very nature, an aye-aye would make for a very difficult patient to work on. 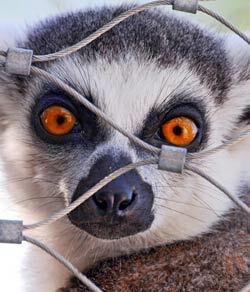 Most veterinarian work that is performed on aye-ayes is done under professional care in a research environment.